Our NCCL Youth went out on a social for the last Life Group of the year. Our Youth Life group usually meets every other week in a church member’s home to learn more and grow in their Christian faith. 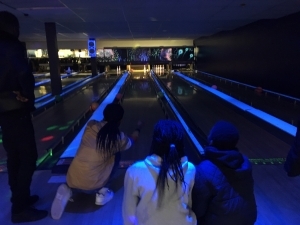 With Christmas fast approaching, we took the opportunity to relax with a ‘friendly’ game of bowling… or so we thought. With some poor bowling skills at the beginning, it was anyone’s game to win. Then the tables turned, half strikes started to flow. It seems there is a lot to be learnt from bowling. A few of us, or perhaps I should say the most competitive and sporty with determination and grit, decided that chucking the ball as fast as possible down the lane would bag the victory – fast bowlers. However it seemed a few of the more relaxed, seemingly less sporty and less experienced, employed tactics of aiming the ball with a soft roll down the lane – soft rollers. Needless to say the more frustrated the fast bowlers got and the harder they tried to throw the ball down the lane, the more the soft rollers earned strikes with carefully aimed rolls. Toward the end the supposed to be relaxing game of ten pin bowling, ended up with a tense play off in the 10th round due to well-earned strikes in the 9th. The two most competitive players came last – the fast bowlers. Who won out in the end? The soft rollers! What was the lesson learnt from this fast bowling youth leader who came last…? Sometimes we can try to do things in our own strength, trying our hardest to win, throwing ourselves at life the fastest we can, perhaps with no careful consideration and planning. However, it is perhaps better to sometimes sit back & plan, consider the options, set some goals, slow down, ponder and trust that God has got a plan for good for our lives and guides our steps. Perhaps if you’re a fast bowler? Take a moment to try being a Soft Roller and see what happens.